Kaizer is a free, turn-based, digital board game for two players. 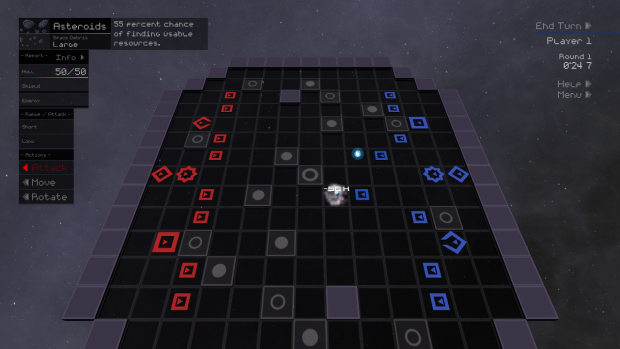 It is focused on fun, balanced gameplay with variable strategies. 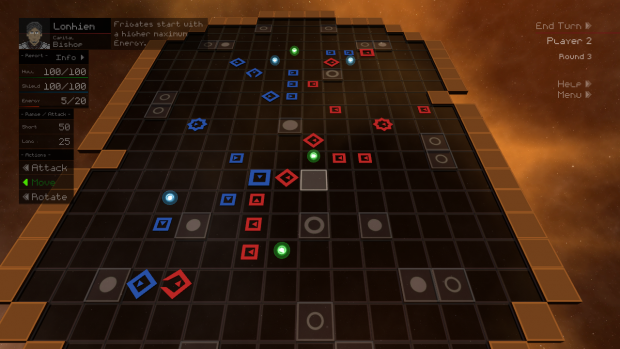 The game currently includes multiple Captains for various strategic options, a wide range of Sectors (boards) to play in, an expansive help system, and printable instruction manual. Kaizer is under heavy development. Kaizer is a free, turn-based, digital board game for two players. It is a game about asteroid mining, resource management, tactical warfare and ruling the universe. But don't worry, it comes with an instruction manual. Many Captains have been changed to better balance the game while keeping them strategically or tactically unique. All Captain abilities have been changed to be based on the classes of ships. The main menu & in-game menu both went through some heavy reworkings. And the in-game menu now has some added "Restart" and "Restart with.." options in the Quit section. And an Overview section for current Sector and Captains. More will be added soon. Chance of getting a resource from space debris has been increased and is now shown in the Info window. And hull and shield resources have increased, restoring 50 & 25, respectively. Lots of Sector changes. Still working on many of them, but they're significantly more fun and have more interesting choices in general. Kaizer 1.00v2 is available! Meet the Captains and choose your strategy. The first Mac version of Kaizer, Sector previews, new Sector backgrounds, new camera and more. New version on the way. Expect it by the end of the week. Tracking! Sweet minimalistic look reminds me of Geometry Wars. Very interesting game. Looking good right now. FYI: Version 1.0 will be out on the 10th (next Sunday). Agreed, and it's all under development. But so far I'm trying to put gameplay first and foremost, so seeing the ships in action might be a while (i.e. after 1.0).